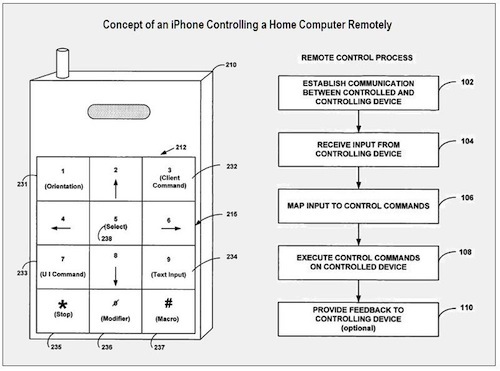 A patent to use the iPhone to remotely control a desktop computer filed by Apple Computer was published by the US Patent and Trademark office today. According to the patent, you will be able to use your iPhone to remotely control the movement of the cursor on a remote iMac or Macbook, launching applications and selecting options. Apple's patent also describes how the iPhone could use a keypad that is mapped to specific functions. Masahiko undid the tip two buttons of his tunic and withdrew a six-inch square of something black and rigid, no thicker than a pane of glass. He brushed it purposefully with the fingers of his right hand, beaded lines of colored light appearing at his touch. Though these were fainter here, washed out by the train's directionless fluorescents, Chia recognized the square as the control-face of the computer she'd seen in his room. In the novel, the control-face is essentially a touch-screen that controls the computer; you can put it back on the computer, or take it with you and have full access to the computer wherever you are. It's a very slick idea - and I'll bet, patentable.